Lynn just knows what I like. Lots of hot, steamy cheese topped with salty nuggets of bacon. Top your life with extra cheese and bacon with the ARG Facebook Group and follow all the delicious details of my life with my twitter feed @Iamarg. And take a moment today to remember and recognize all the fighting men and women who have sacrificed a lot. Happy remembrance day folks. 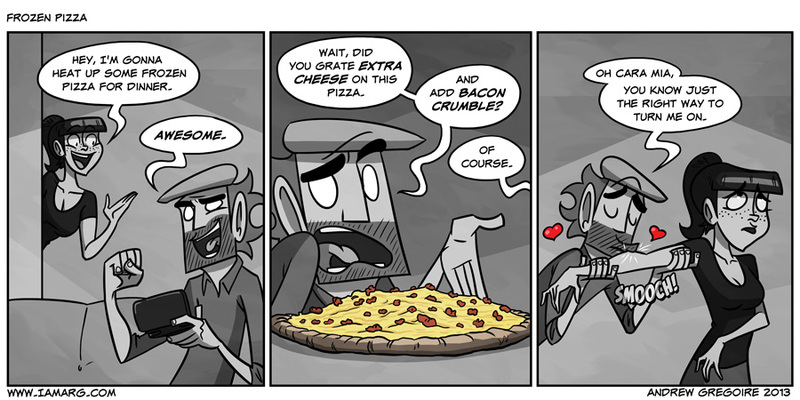 Bacon Crumble is the ultimate aphrodisiac! The way to someone’s heart is through their stomach doesn’t’ necessarily apply for only men. Girls go nuts for a guy who can cook well. I should add bacon next pizza I make. Ughhhh how come it won’t work? It was a smart move on Lynn’s part to not use bacon-scented lotion on her arms that particular morning. Thinking Ahead – This is how accidents can be avoided, people. Want the best out of pizza taste, go to subway, ask for cheese pizza along with extra sliced chedder cheese on it, then savor your tongue! Best taste from pizza ever! Lynn you know me too cara mia….